Last fall, we shined the spotlight on cider, but this installment of our Toast to travel series is all about sake. This alcoholic drink, made of fermented rice, water, yeast, and koji mold, has been brewed in Japan for centuries and is growing in popularity around the world. Here’s what to know about Japan’s signature drink. While we think of sake as rice wine here in the West, it’s actually a brewed beverage closer to beer. In fact, the word sake translates to alcohol in general; the sake we think of is called nihonshu in Japan. When drinking sake with others, it’s customary to fill your neighbor’s cup and to let them do the same for you. In fact, it can be considered rude to pour your own sake, hinting that you don’t trust your host to take care of you. Sake is a social drink that’s meant to be shared. Once everyone’s ceramic cups are filled, raise a glass with a friendly kanpai. To show respect to an elder or coworker when you toast, make sure that the rim of your cup clinks below the rim of their cup. 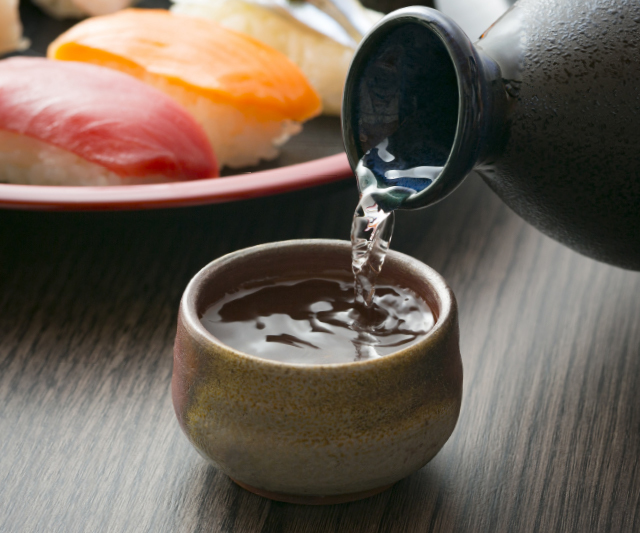 In traditional settings, sake is poured from a decorative flask, called a tokkuri, into small cups. These small, delicately painted ceramic cups, called ochoko, likely got their name from a derivative of the Japanese saying for “just a little,” making them the perfect vessel for slowly sipping sake. Some sake varieties, like junmai and honjozo, are best served warm; others like ginjo and daiginjo are best moderately chilled. To warm sake up, place the entire flask into a pot of water and bring to a boil. While sake is a part of big moments like weddings and New Year’s Day, it’s also a way to sit back and enjoy life’s simple pleasures, too. The Japanese actually have specific names for sipping sake during these universally happy moments. This means drinking sake while admiring the hanami, or the country’s colorful cherry blossom season. Experience it for yourself on our special spring Japan tour. This refers to drinking sake while celebrating a full moon in autumn—considered an offering for a good harvest. Read more about visiting Japan in the fall. This term translates loosely to drinking sake while peacefully watching the snow fall outside your window. Check out these four drinks to warm up with this winter. Have you ever tasted sake? Interested in traveling to Japan to try it? Let us know in the comments below.